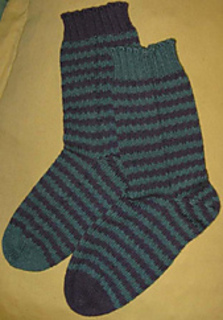 This pair of socks was designed to use 1 ball of each of two colors of sock yarn. The subtle surprise of these socks is that they are the exact opposite of each other. They are not very tall socks. If you would like longer socks, the pattern can be easily adjusted, but it will require additional balls of yarn. The construction is toe-up with an afterthought heel. 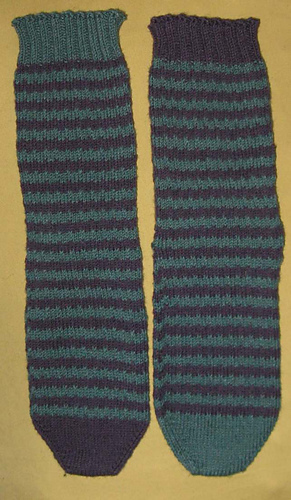 They were designed to be worked two at a time on 2 circular needles, but can also be knit using Magic Loop, or one at a time on DPN’s (4 to hold the sock, and a fifth working needle). 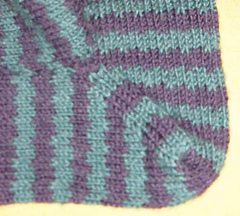 A subtle slipped stitch pattern adds a bit of texture and helps to mask the dreaded ‘stripe jog’. At this point, it is just in one size - if more sizes are added, I will update the pattern and the link. To those of you with small feet - I’m sorry. There are so few patterns out there that are intended for feet as big as mine, and bigger… I wanted to add one as soon as I got it written up. These socks were designed and first knit while waiting for days in a hospital during a very negative situation which had a very positive outcome. There is a whole lot of mathy stuff going on in these socks - none of which is particularly interesting - but all meant to appease my sometimes overbearing need for balance, symmetry and proportion. Add in a few good old bits of medieval numerology and symbolism, and we get a pair of funky stripey socks, which hold the keys to earthly life and heavenly perfection. Just what I needed.